Replacing lost teeth offers significant benefits in terms of how you look, feel and function. There are several ways to replace missing teeth, but today’s state-of-the-art solution is the dental implant. 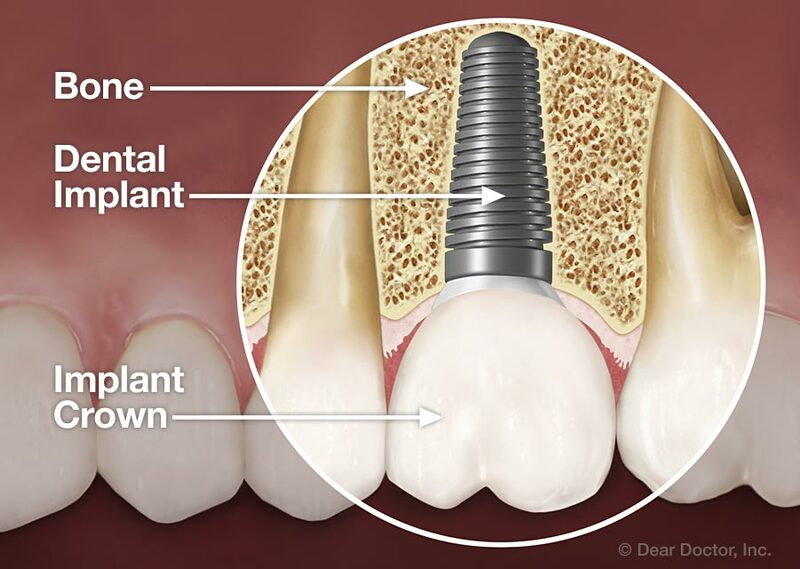 A dental implant is a small, screw-shaped post that is located in the place where your missing tooth used to be. Because it is made of titanium, the implant will eventually become fused with the bone beneath your gums. This offers an extremely secure base for the realistic dental crown that is attached to it. The crown is the only visible part of the implant tooth — the implant itself remains beneath the gum where it can’t be seen. Comfort. Dental implants mimic the roots of natural teeth, which means they feel like natural teeth. Unlike removable dentures, they do not require you to learn new ways of eating and speaking, and they will never slip, become loose or embarrass you. Once your dental implant has fully integrated with your own bone, you’ll forget you even have an implant tooth. Safety. Dental implants do not carry risks associated with other tooth-replacement methods. For example, full dentures can promote bone loss in the jaw because of how they apply pressure to the bony ridge beneath the gums. Partial dentures can weaken the natural teeth to which they attach. Likewise, bridgework can weaken the natural teeth that support it. Dental implants do not harm adjacent teeth and they do not stress the underlying bone — they actually strengthen it. Longevity. Dental implants are designed to last for life. If you take care of them as you would your natural teeth — with good oral hygiene and regular dental visits — they should hold up for the rest of your life. This is not the case with other tooth-replacement methods: Dentures are breakable and need periodic adjustments; bridgework must be rebuilt if the teeth supporting it fail. Versatility. Dental implants can be used to replace one missing tooth, a group of missing teeth, or even a full set of teeth. You don’t even need one implant per replacement tooth because multi-unit bridgework can be created with strategically placed dental implants. That means you might need as few as four implants to support an entire upper or lower set of new teeth. While dental implant surgery itself is a routine, same-day procedure, it’s important to understand that the process of getting your new implant teeth will actually take several months. This includes the preliminary exam and planning, the surgery itself, and the healing period. Careful planning and timing of the various stages of implant treatment will ensure the best possible result. Planning. A series of x-rays and possibly 3-D CT scans of your mouth will be taken to assess the condition of the bone that will support your implants and determine their ideal placement. The scans will also show the locations of any anatomical structures that need to be avoided, such as nerves or sinuses. Your options for anesthesia will be thoroughly discussed so that you will be completely comfortable. It is rare for a dental implant patient to need anything more than a mild-to-moderate level of conscious sedation. Surgery. On the day of your implant procedure, you will be given the type of anesthesia and/or sedation that’s best for you. Once you are completely relaxed, a small incision in your gum will be made to access the bone beneath. Next, the implant will be centered so that its location will allow for an excellent, natural crown to be made. Then, your gum might be sutured over or around the implant depending on whether a “healing abutment” is attached, which is visible above the gum. If you are having a single tooth replaced in a prominent location, you may receive a temporary crown that day so that you don’t have to leave the office with a missing tooth. If you are having all of your teeth replaced, you may leave with an entire set of temporary teeth. This will be determined in advance. There is very little post-operative discomfort associated with dental implant surgery. Healing. How well your implant integrates with your bone will determine the success of your treatment. Therefore, in the weeks immediately following your implant treatment, you need to be extremely careful to follow directions so you do not disturb the implant(s). A soft diet will be recommended and you will be monitored periodically. New Permanent Teeth. When your implants have become solidly integrated with your bone, you will receive your new tooth or teeth — which have been custom-made just for you. Attaching replacement teeth to implants requires no anesthesia. You will be instructed on how to care for your dental implants. Then you can leave the office with a rejuvenated smile!